in the library 'VANnU' in Roosendaal, Holland. March 23rd 2009 “open Oog – open Ik” - Spirit 24, Dutch digital television. in Het Kruithuis, Den Bosch, Holland. 34 Broadcasts of the German version (“Gestern im Gepäck – Stationen auf dem Weg nach Morgen”) on ZDF dokukanal. 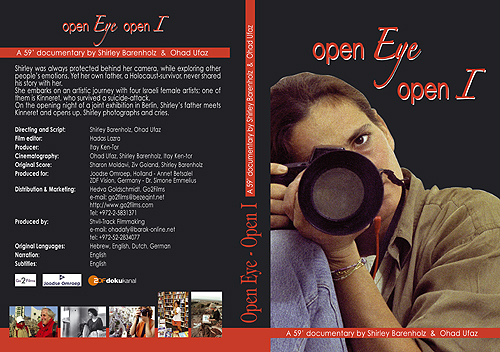 January 29th 2008 Screening of "open Eye – open I" (Hebrew subtitles) at the Cinemateque of Jerusalem at 21:30. Both directors will be present. January 27th 2008 Israeli première of "open Eye – open I" (Hebrew subtitles) at the Cinemateque of Tel Aviv at 19:00. Both directors will be present. "open Oog - open Ik"
The original English version of 'open Eye - open I' will have its Canadian premiere at the Toronto Jewish Filmfestival in Canada. Time & Place: at noon in the Al Green Theatre in Toronto. After the screening there will be a Q&A and small reception, where Shirley will be present. 24th 2007 at the Museum of Visual Arts in Leipzig, during a special event 'German and Israeli relationships', organized by Club Bertelsmann, Museum of Visual Arts, Israeli Embassy and German Cultural Radio, as part of the Leipzig Bookfair. The film will be screened each evening two times as an 'add on' to the program.